The Assassin's Creed games have never enticed me. I've peeked behind the curtain and played several hours of the first two in the series, but it wasn't until Black Flag, the series' fourth official installment, where I began to take notice. Despite this, I somehow own all of them, even the side-scrolling adventures that took the gameplay in a whole new direction. It was almost a year after the release of Syndicate that I even broke the fresh seal on the game and frankly, I didn't care for it. While I did get pretty far into Black Flag, I never did beat it. While I can comfortably say that Origins is the best of the series, those words can feel a bit hollow considering my history with the franchise, but considering I've actually beaten the game and nearly every side quest available, that has to account for something, right? One aspect of the series that didn't really work for me and frankly, it was one of the reasons I didn't beat Black Flag, was the jumping back and forth from the past to the mega-corporations of the future as people plugged into machines were diving into the past lives of these people to track down various secrets and what have you. While I'm all for science fiction hybrids, to me it just didn't mesh well and when it started to show itself in the game via digitally walled off areas that you didn't have access to, that's when I just wasn't having any fun. Origins, thankfully, has these occurrences in such minimalistic ways that it never feels intrusive and I only ever ran into the digital walls once during my whole time with the game. It's no secret that Ubisoft took an extra year off to really put a lot more development time into this game and it shows. Assassin's Creed Unity was a massive disaster for the publisher as the game, which was made by 10 different studios, was a buggy mess that pretty much destroyed the launch of the game. Assassin's Creed: Origins feels polished in ways that most Ubisoft games just don't. Sure, there are a few bugs here and there, but nothing compared to their more recent releases and I hope that Ubisoft takes note of this. As I write this review, it was just announced that Far Cry 5 and The Crew 2 have been delayed to have more development time spent on them, so maybe this is a sign of hope. This extra time was spent on reworking certain series staples and bringing some fresh new elements into the game. After spending probably close to 60 hours with the title, It is plainly obvious that Ubisoft looked to The Witcher III as inspiration, a game made by a fraction of their Assassin's Creed team size, I might add. Origins feels like a Witcher game in a lot of respects, but a pale imitation at best. While the open world is massive and thankfully doesn't feel copied and pasted like so many games do, it lacks in feeling truly alive and rarely does the game ever attempt to change that. It also doesn't help when I have two identical NPC's walking in front of me both saying the same lines but a fraction of a second apart from one another, creating a very annoying echo. While something like that could be chalked up to a rare glitch, it happened well over a dozen times in various locations throughout the game. Assassin's Creed: Origins does lessen the icon BS that comes with an open world Ubisoft game, but just barely. The map is still packed with a variety of icons that can feel intimating, but rather just consists of a lot of pointless fetch quests and clue searching scenarios that you'll do a few dozen times over, each with some poorly constructed narrative to set the scene. While yes, there are tons and tons of side quests, many of them are incredibly boring and repeat the same mechanics over and over again. It's not all bad as the Tomb locations are incredibly well done and feature a few lite-puzzles to progress deeper into them. These locations are hands down the best content but sadly, there just isn't many of them. The main story, and yes, even a few of the side quests offered, is really well put together and can entertain for dozens of hours. The story of Bayek and his wife Aya taking to revenge after events early on in the game sees the death of their son at the hands of the Order of Ancients, is well told. That being said, the way in which the revenge is acted upon gameplay-wise, isn't so. The targets, apart from a few of them, feel generic and merely another checkbox along your blood filled path to the credits. This is even truer when it comes to the final target, a fight that was so easy, I sort of expected the fight to keep going until it didn't. Revenge stories work best when you become invested in the cause, you want to hate the villain and sure, you can hate the masked man the game initially paints for you, but the fact his identity is a secret until the final few hours, well, it's a dumb move and made me care almost nothing as I impaled him on my shiny gold spear. The assassinations of the plot-centric targets themselves are very copied and pasted in terms of their set up. You'll enter a new area of Egypt and find out who a certain mark is and then you are presented with the location. You'll proceed there, use your bird to scout the area and bing bang boom, you have your target. Apart from taking out the entire base or being super sneaky and just ignoring them, you can approach and kill your target with almost no fuss. There isn't any real elaborate planning required and even the final encounter took me maybe 5 minutes to reach from entering the area. Origins features a massive map that is begging to be explored, however; I found it rather disappointing that when I was nearing the final mission of the game that I hadn't even explored a solid third of it, with many locations on the map still blacked out. Once I completed the game, I traveled to these locations and it became quite clear why I hadn't visited them throughout the story; they were more or less empty. There is one such location that has maybe a few roads between some mountains and a few areas that need to be explored to earn some gear, but that was about it. Sure, the map is rather expansive and looks engaging, but so little of the map actually features interesting locations to explore. Despite those wasted sections of the world, the cities and settlements featured here are jaw-droppingly beautiful. The architecture and busy streets of Alexandria are stunning, as is Memphis and Kyrenaika. There are wide open spaces like the Nile Delta, and Faiyum, that are some of the best looking environments I've seen this year. What I found the most interesting, and a reason why I decided to actually play this latest entry, is that Origins was set to show the birth of the Assassin Brotherhood. While I could easily be missing a few nods to the previous games, as my experience with them is somewhat limiting, I know of a few elements that are teased here as Bayek is instrumental in the creation of not only the Brotherhood, but many other aspects of the Creed they swear by; you even see in some ways how the logo for the Assassin's themselves is created. While it's unclear if any of this was planned back when the original game came out it's done in such a way that it feels natural, at least to what I know of the series. As I mentioned above, you rarely ever leave the simulation of Bayek and Aya to brave the real world. There are a few moments where you do leave the Animus, but these are short experiences that only last a few minutes. These short bursts out of the Animus tell a personal story for the character you briefly control, and one such scene late in the game is easily setting us up for the next adventure, one of which I hope doesn't have these future scene drag on like in the previous games. These scenes were also why I thought the live-action Assassin's Creed movie was sort of trash as it dwelled far too much in the future when the interesting parts of the story take place in the past. Bayek himself is a fairly interesting character and voice actor Abubakar Salim does a great job at conveying all the needed emotions of a parent seeking revenge, as does Alix Wilton Regan as his wife, Aya. Both characters are really well developed here and compliment each other when the narrative places them together, which is a somewhat rare occurrence. Again, while I never did fully dive into the previous games, I found Bayek to be far more relatable and worth investing my time into than previous series protagonists. Being an open world game with dozens of side quests, there still is that unbelievable nature that you'd stop to help someone track down a relic while you have this important revenge story going on, but that is easily one gameplay element that cannot be helped with this style of game. 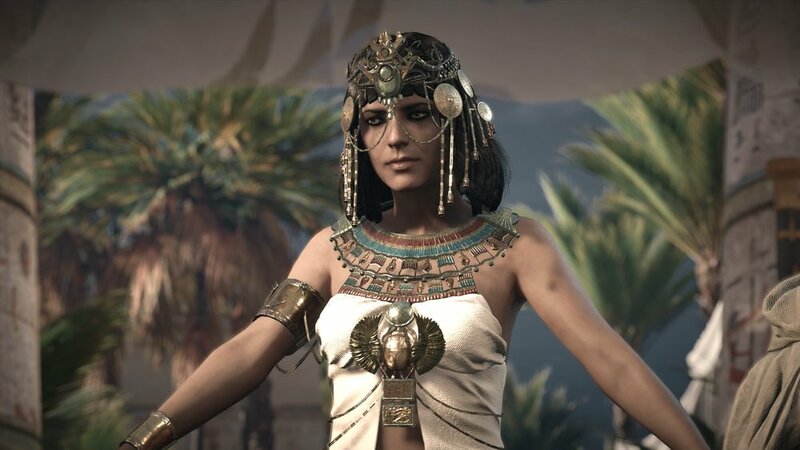 While there are countless side characters via side quests and the story-centric missions, none of them hold a candle to Cleopatra. Now, while the depiction of the character isn't historically accurate according to what has been said about her, the version here is pretty damn great. The costume design alone for her is stunning and honestly, it is some of the better material in the game. I enjoyed her voice acting and thought that actress Zora Bishop did a fantastic job. Combat in Assassin's Creed: Origins is incredibly fast and very satisfying, and again feels lifted from various games, one of which is, of course, The Witcher III. You have standard attacks, shield-breaking heavy attacks, and the ability to block, parry, and dodge. The weapon you wield will also dictate the speed of your attack and the reach it has when confronted with the enemy wielding the counter to yours. I found shielded enemies to easily be the toughest to deal with, but once I started to unlock poisonous or fire-based arrows, then a solid shot to the head would often expose them for a good old fashion beatdown. You can equip two weapons for melee as well as for range attacks as well. Once you've unlocked tools, then you can start tossing flammable jars and shooting sleeping darts to assist in combatting enemy forces. Bayek can also sneak up behind someone and take them out too, as the stealth is pretty flexible in the line-of-sight your enemy will have. My only issue with how stealth is handled here is you can't shoot a bow from stealth if the enemy is facing your direction, even if they are rather far away, they will still see you. I found it rather easy enough to deal with numerous threats at once but always attempted to stealth as much of an encampment as I could. There are slight control issues of Bayek not letting go fast enough or attempting to climb something as I was attempting to flee, but it rarely ever led to me getting killed unless the enemies were far higher level than I was and If I had been attempting to run away. It's a short while into the game before you can flat out assassinate like a proper assassin, but once you get that ability then it makes for a much easier experience. There are short moments scattered throughout the game where you will be in control of a ship and tackle some naval battles in a similar style to that of Black Flag. The mode was actually so popular and well received that the upcoming Skull and Bones game was made by the team that handled those moments back then. The battles here are short-lived and lack the depth of what was present in Black Flag, but it was nice to once against have an assassin out on the open sea. As you explore Egypt and complete various missions, side quests, and collectithons, you'll earn XP and unlock new gear and weapons. Each of these items come in blue, purple or gold and some vary in perks like regenerating some health in combat or setting things, or people, on fire. Weapons come in a small variety of swords and spears, and a range of heavy weapons that while slow, can pack a real punch. Each of these weapons has a level range and sometimes you'll unlock something you cannot use for a few levels. There is also a wide range of bows that allow a build-up of distance or a rapid-fire assault of firing multiple arrows at once. Should you find a weapon that you really like, you can stop at a blacksmith and upgrade that weapon to do much more damage. Some of the best gear you'll unlock is when you take out any of the 10 Phaylakes that are sent to track you down after a certain point in the story. These elite guards range up to level 40 and can be quite the challenge if you are not ready for them. One of my favorite encounters with one of them is one that attacked me in a town square, an area that was littered with flammable jars everywhere. I equipped my fire-based bow and dodged around him until he stood next to a collective of said jars. I let out an arrow and he instantly died in a wall of flame. The fire was everywhere, he didn't stand a chance. These battles were extremely fun and the loot they dropped was miles better than what I was already wielding. There are a few items like your assassin blade and some armor pieces that remain on you despite your chosen gear that you can upgrade by collecting crafting items like various leathers and pelts. The upgrades to these items will allow your assassin blade to deal more damage, the quiver to allow for more arrows, and the glove which increases your ranged damage. I didn't feel that these items required me to drop everything and grind materials for any more than a few short hours. Origins features a skill tree that you'll unlock skill points for by either leveling up or completing certain tasks. You can also buy skill points in the store, but frankly, you'll easily earn enough to fill the board in no-time. Bayek can put points into The Warrior, The Hunter, or The Seer. The Warrior path is a lot of physical based skills that makes you more effective in melee combat, whereas the Hunter is for enhancing your use of the bow and the Seer is for equipping smoke bombs, calling your mount to you, or taming wild animals. There are over 50 skills to put points into with each path having a special skill to unlock at the end of that chosen path. My entirety of Assassin's Creed: Origins was played on the newly released Xbox One X and it looks incredible on the new system. The 4K powered console features far better draw distance, more detailed architectural models, vegetation, and rocks. The detail in the character models is far better as well with more attention given to the cloth and fabrics the characters wear, giving them higher resolution textures to make a lot of subtle details pop. The game running on standard Xbox One S and PS4 consoles has reported having some performance issues in larger more detailed areas, and the vegetation and environmental details are also greatly simplified. The Xbox One X version sits somewhere along the lines of the best the PC version can output and a bit higher in performance than Sony's PS4 Pro. 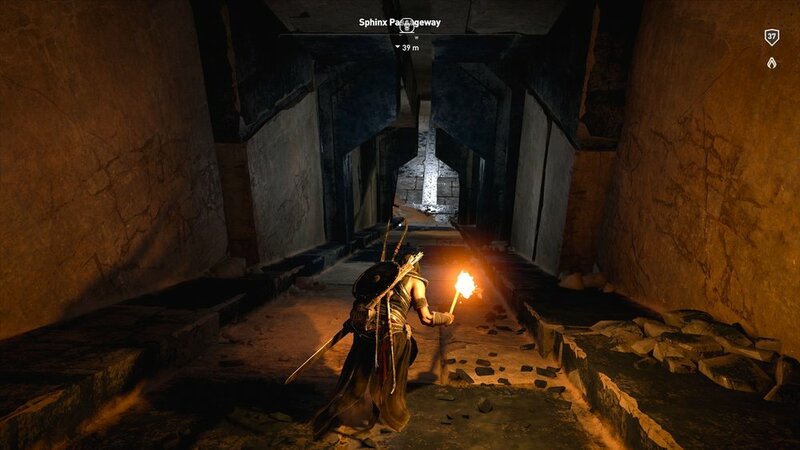 Assassin's Creed: Origins is a gorgeous game regardless of platform but the enhanced versions of each console do give a better experience overall. Ubisoft has created an online store for the game that allows you to buy new outfits, weapons, and skill points, should you want to fast track Bayek in his combat potential. I purchased the flaming horse, an outfit pack, and that was about it. The store isn't as intrusive as say Shadow of War, but it is there should that sort of thing bother you. I didn't know what to expect with Assassin's Creed: Origins. I wasn't a huge fan of the previous games and while Origins hasn't turned me into a believer, it has made me hopeful about the future of the series. If Ubisoft can eliminate a lot of the random busywork that makes up most open world games and gives us side quests that have meaning and value, instead of filling up the map with endless icons that just lead to repetitive mechanics, then I look forward to another entry in this series. Origins is a step forward in the right direction to refine a lot of the what the series has had stale for years, but there isn't enough new ideas and polished gameplay to put it up there with the best the industry has to offer. assassin's creed: origins WAS PURCHASED BY THE REVIEWER.